Capitalism Is Obsolete: If We Have Full Employment, Will It Save Us? We have to be clear from the start, of course, that less unemployment is a very good thing. And the more that people are wanted, and wanted to be placed in meaningful jobs, the better. Which not only means jobs that pay a living wage, but also aren't just feces jobs that nobody wants to be stuck with. 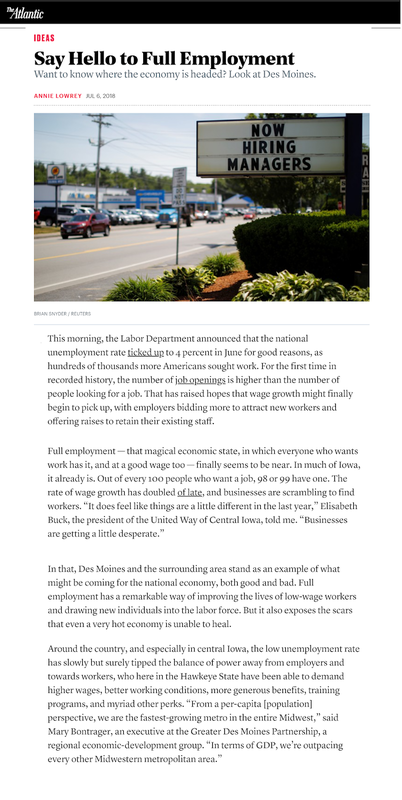 Jobs that do something that helps your community for instance, rather than, say, make huge profits for somebody else, as well as questionable side effects; which we will likely never learn about down the road because media concentration, and business concentration in general, will make such "embarrassing" facts seem to be just magically disappear. And therein lies just the start of the problems that continuing with this outdated monster will continue to present us with, even if it does get all of the wet ware working. And even if they are meaningful jobs to a significant degree. And even if the potential for accumulating disasters doesn't put a quick fallout to the current "fever dream" of escalating economic activity, would we really want everybody suddenly demanding more consumer goods? All across the boards, for all developed nations? Knowing not only that so many of these processes are toxic, in one way or another, to our health, and the health of the planet, but also because it would only serve to increase the dangerous competitions for the very increasing markets, and the resources that everybody is having more difficulty finding as well? Does that really sound all that more sustainable to you? It does not sound all that sustainable to me, but then I'm just a crazy old, humanist dreamer. To me it just sounds like we are all keeping a good deal more busy, and distracted, because a good portion of us will have marginally more money to spend on a still sinking ship. Oh happy day.